These country classic song lyrics are the property of the respective artist, authors and labels, they are intended solely for educational purposes and private study only. The chords provided are my interpretation and their accuracy is not guaranteed. 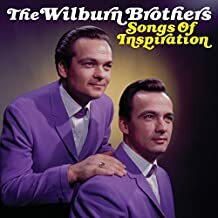 Wilburn Brothers lyrics and chords are intended for your personal use only, these guys recorded many wonderful songs that us amateurs can learn. To me, there's no better music than classic country. The Wilburn Brothers were born in Hardy Arkansas in the early 1930's into a musical family. They attracted attention as child performers beginning in 1937 with an act called The Wilburn Children. Roy Acuff discovered them and brought them to the Grand Ole Opry in 1940. After growing up they were regulars on the Louisiana Hayride from 1948 until 1951. Both brothers served in the US army during the Korean War. In 1953 they continued touring as The Wilburn Brothers and toured with Faron Young and Webb Pierce. Decca Records signed them to a recording contract in 1954 and their first hit "Sparkling Brown Eyes" came the same year. Many hits followed over the years and they were instrumental in launching careers of several country music legends such as Loretta Lynn and Pattie Loveless. The Wilburn Brothers TV show was a great success running from 1963 to 1971 and they were members of the Opry until the time of Doyle's death in 1982. Teddy continued as a solo artist with the Opry until his death in 2003. They had such great harmony and left us with so many great great country songs. Low prices on Wilburn Brothers Cds and easy to download MP3s .